for luxury fireplaces. Achieving advanced levels of performance, functionality and refinement. Icon Fires opens a world of creative scope and pushes the boundaries of fireplace design. Fine detail and quality finishes distinguish the new series of Slimline Burners. They’re designed to be discreet and allow the vibrant flame to be the star of the setting. The unique Mounting Frame enables flush fitting into the surface. Slender, elegant proportions and the soft tones of the brushed stainless steel surfaces ensure the Slimline Burners to take a low profile. Stretched fires are the order of the day in today’s architecture and Icon Fires responds with its Slimline linear burners and fireboxes. Slimline offers the longest linear bioethanol burners of 1100mm and 1400mm producing stretched continuous flame for dramatic effect. Zero Clearance Fireboxes suited for inbuilt installations. Black interiors enhance the flame’s effect. With a choice of Black or Stainless Steel fascias. 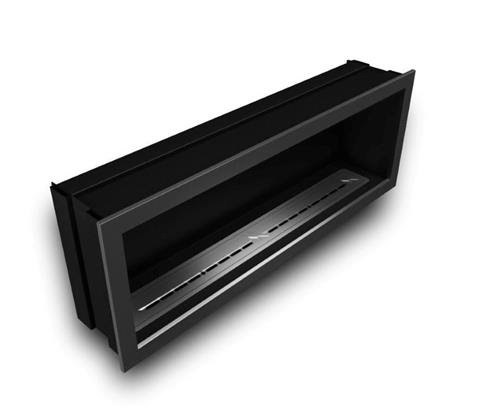 Slimline offers 4 burner lengths to suit a variety of installation requirements; 500mm, 800mm, 1100mm, 1400mm. Flame stability, efficiency, fuel economy and heating performance are all enhanced with the newest technologies used across the Icon Fires range. 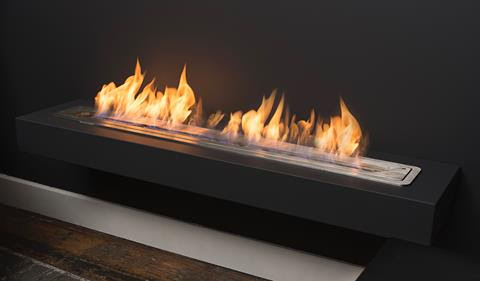 The Slimline Burners include flame adjustment to regulate heat output and flame height, which is an industry first fromIcon Fires for this style of burner. Is a renewable energy source produced from vegetable matter. It creates a vibrant,clean burning flame.